﻿Unanimously regarded as one of the world’s best finishers in ODI cricket, Michael Bevan was born on 8 May 1970 in Belconnen, Australian Capital Territory. He was a left handed batsman who had a ‘golden arm’ with his slow left arm chinaman spin. 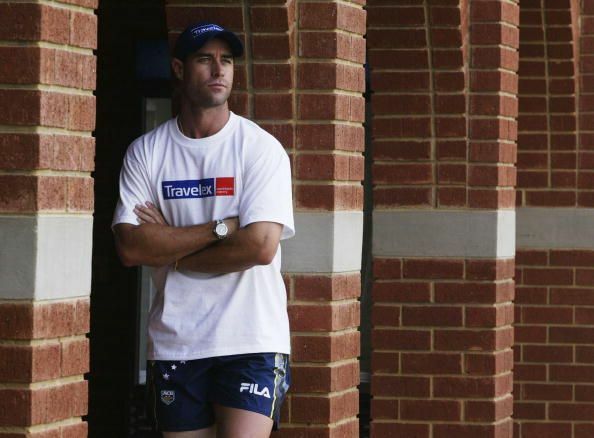 He was one of the crucial members of the Australian World Cup winning squads of 1999 and 2003. He has a batting average of 53.58 in ODIs which is the highest batting average by a retired player. Bevan used to play for New South Wales until 2004 when he moved to Tasmania. He has a batting average of 57.86 in List-A cricket. His performances in the shorter format of the game earned him a place in the Australian team. He has also played cricket for teams like South Australia, Sussex and Leicestershire. During his early days, he established himself as a reliable batsman who would take Australia home from difficult situations. His one of the most famous innings is the one played against the West Indies on 1 January 1996. He scored a not out 78 guiding the Australian ship to the shore of 173 runs when they were 6/38 at one stage. Bevan made his ODI debut in the Austral-Asia cup match against Sri Lanka. He didn’t get to bat or bowl in that match. In his second match against New Zealand, he scored 39 runs off 63 deliveries. It wasn’t the greatest innings but Bevan did what he did best, finishing the game while being at the crease. Bevan remained not out 4 times in his first 10 matches spiking his batting average to go above 50 in the early days. Apart from the match-winning innings against the West Indies in 1996, he has sailed the ship of Australian batting on numerous occasions. On 10 April 1997, Bevan scored 103 against South Africa’s total of 284 at Centurion to steer Australia to a win from 3/58. On 29 January 2002, Australia were struggling at 6/82 while chasing a target of 246 against New Zealand at Melbourne. Bevan came out to bat and played his usual game when he scored 102 not out to guide Australia get over the line. His 74 not out in the 2003 ICC Cricket World Cup game against England when Australia were at 8/135 helped build the course to the World Cup victory for Australia. In the World Cup Super Six match against New Zealand, his services were again required when Australia were 7/84. He didn’t disappoint again with his 56 not out leading Australia to victory. With his match saving innings every now and then, he remained one of the most impactful members of the Australian batting line-up which had the likes of Ricky Ponting, Adam Gilchrist and Matthew Hayden. Though he was a prolific one-day player, he played only 18 tests for Australia in which he scored 785 runs at an average of 29. His lack of confidence against short-pitched deliveries led to the downfall of his test career. Bevan played his last ODI against Sri Lanka on 29 February 2004. In 2007, he announced his retirement from all forms of cricket due to a string of injuries. Australian team when Matt Renshaw was born: Where Are They Now?